I don’t usually blog about blogging, but since many of you have mentioned starting a money-making blog as one of your goals this year, I wanted to share some tips that have helped me succeed. UPDATE: Elite Blog Academy just released 2018 Blogging Trends Report. While you definitely don’t need to follow every trend that pops up, this report focuses on the most important trends that are worth paying attention to. It’s free to download! Besides being a great way to hold ourselves accountable and a great place to share ideas and encouragement (and have you share ideas and encouragement with us), this blog has been a substantial source of income. 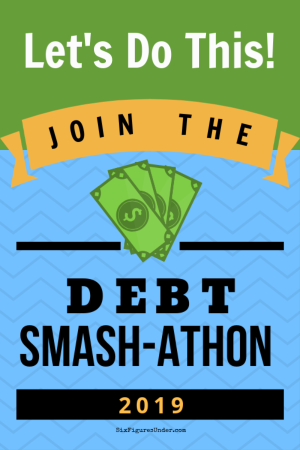 In 2015 we paid off just over $32,000 of debt. Before my husband’s new job in September, his base income was just $39,000. That sort of payoff on that sort of salary was only possible because of side income, which primarily came from this blog. Not too long — This goes along with easy to remember, but also easy to read as a website address. 2- Go with a self-hosted WordPress site. If you have plans to make money from your blog, then you will want to have a self-hosted blog on the WordPress.org platform (not blogger or WordPress.com). Having a self-hosted site means you have to pay for hosting. It will be worth it though. I have a complete tutorial for how to set up you self-hosted WordPress blog complete with screenshots and simple, non-techie directions. 4- Organize your site. Make a navigation bar that makes sense and makes your content accessible. Visitors should be able to tell in a glance what your blog is about and what topics they can expect to find there. 5- Keep it a secret at first. Don’t worry, you’ll you’ll have a chance to shout it from the rooftops soon, but in the beginning you want to keep your site a secret. You don’t want your first visitors to come and read an article they love only to find that you don’t have anything else to read. They’ll wonder if you’re planning to write more or if you were just a fly-by-night one hit wonder. Once you have about a dozen posts covering the various main topics your blog will cover, you can start inviting people to visit. 6- Have a Pinterest-friendly image for every post. By Pinterest-friendly, I mean you should have a long (giraffe-style, if you will) image with an eye-catching relevant photo. Add some clear text to the picture to pique the interest of those who will see the image on Pinterest. 7- Make every post inbox-worthy. Don’t post just to post. A blog post is not the place for announcements like a change to your blogging schedule or a funny thing you saw on your shopping trip. Those are social media status updates, not blog posts. You want your subscribers to know that when your blog has an update or they receive an email from you, it’s worth their time. Each post should add value. I think this is one of the huge differences between a hobby blog and a blog for profit. If you can’t write at least 500 words about the topic, then it doesn’t deserve its own post. 8- Use great photos to make your Pinterest-friendly images. You’ll quickly find that good free stock photos are hard to come by. They just plain aren’t as good as the ones you pay for. Plus, they are used by lots of bloggers, so you’re likely to see the image you choose used by lots of other bloggers. To start, I recommend Bigstock photo. You can get a 14-day trial with no strings attached where you can download 5 photos per day (that’s 70 images total!). Look for photos that you will need for future posts and stock up during the trial. 9- Proofread your posts. Everyone has typos that slip through. That is understandable. Reading through your posts slowly (or out loud) one final time before publishing will help you catch the majority of errors. If spelling and grammar aren’t your thing, have a friend or a family member go through each of your posts before you click publish. 10- Be kind. Always. Unless you have a brand that is built on sarcasm or mean-ness, then strive to be kind. You catch more flies with honey than vinegar. When you’re communicating with the written word, I find it best to go above and beyond when it comes to kindness, as people cannot always read your tone of voice. 11- Use clean language. Maybe this is just a personal preference, but if a blog has profanity, I will stop reading and likely not return. That is a huge turnoff for me and I know I’m not the only one. Foul language will limit your audience. Sponsors will avoid working with you too, as they don’t want their brand associated with a blog that is offensive. 12- End your posts with a question or two. Reflective questions help foster interaction. You’ll get to know your readers and gain new insight from them. 13- Respond to comments. Readers who comment on your posts are engaged and eager to hear your response to what they have to say. Get in the habit of responding quickly to comments so you don’t get behind. 14- Have a plug-in that emails your responses to the commenters (I use this one and like it). If you’re taking time to respond to comments, then you definitely want the readers to actually see your responses. The majority of readers won’t return on their own to find your responses. Getting your response in their inbox keeps them engaged. 15- Download the Alexa toolbar. Alexa is one of the website rankings out there. Though no ranking is perfect or completely accurate, the Alexa rank is a commonly accepted measure of where your blog stands. Essentially, only people who have the Alexa toolbar installed can “vote” on the popularity of a site. You cast your vote just by visiting a site. Since you’ll be visiting your site more than anyone else, having the Alexa toolbar helps to improve your ranking. 16- Start collecting email addresses. While some plug-ins or themes allow you to collect emails so subscribers can receive every post by email, they aren’t all that useful when it comes to sending out your own newsletters (which is where the value in your email list lies). I recommend using a service like Mad Mimi if you’re just starting out. They allow you to collect unlimited addresses for sending RSS updates (notification of new posts). For sending newsletters and other emails, you start with 100 contacts free. After that, the rates are very reasonable. Once you start to get traction, then I recommend moving to ConvertKit. You may have noticed that none of my 16 tips related directly to making money. That wasn’t an oversight. That was completely intentional. There is so much more to think about, plan, and do before you even think about earning money. These tips will set you up for success so that you’ll be ready to monetize. If you focus on making money before you have a solid foundation, you’ll fail. It’s that simple. Focus on great, accessible content and community, and then worry about the money. You definitely can earn an income with a blog on virtually any topic, but it’s definitely not a quick buck. It takes work and dedication, especially in the beginning when you aren’t seeing any profits. Down the road when the money starts coming, it’s easy to keep going. Put in the effort in the beginning that will set you up for success in the future. In fact, if you want to turn your blog into a business you need to start treating it as such. Even if you’re not earning any money yet, you should be tracking your blog finances. If you aren’t keeping track of your expenses, you won’t know when you become profitable. 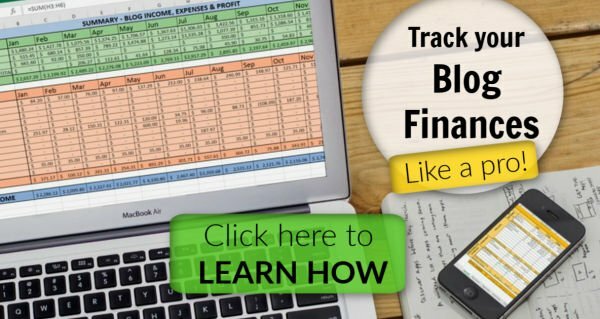 I use Blog Finance Spreadsheets to track and categorize my income and expenses, which simplifies tax time. Blog Finance Spreadsheets are perfect for all levels of bloggers, even if you’re just getting started now! Once you have a blog, it really can earn money. If you’re interested in seeing the details of my blogging income each month, along with other tips and tricks, you can join my behind-the-scenes blogging email list to get the scoop. If you haven’t started your blog yet, now is a great time to get started! Here is a tutorial to get a self-hosted blog set up. If you’re looking for in-depth blogging advice, check out How to Blog for Profit Without Selling Your Soul and Building a Framework, two fabulous resources for beginning bloggers. I know some of you are already successful bloggers. What tips would you add for starting a successful blog? This post contains affiliate links for products or services that I use and love. For more info, see my disclosure policy. Great tips and yes great money can be and is earned with a blog. My traffic growth was pretty steadily growing each month for the first year and a half, then it started to fluctuate seasonally. Are you on Pinterest? Pinterest has been my number one traffic driver since the beginning. Though some of my images from the beginning are terrible (looking back on them now) from the beginning I have included a Pinterest-friendly image (long, rather than wide) with a “pin-it” hover button so my posts are easily pinned. Plus, I have joined group Pinterest boards where I share my content regularly. Utilizing Pinterest is definitely my best advice for traffic. Feel free to email me with any specific questions or for more specifics about traffic numbers. I am on Pinterest (my husband can verify that :)), but I’ve gotten confused at the point of joining group boards. I’ve had a hard time finding specific group boards or learning how to join them, but I will try to research that more since it seems to have been such a help for you. Thanks so much for answering my question! When you post to group boards, your pins are seen by lots more people, instead of just your followers. Plus group boards move faster, so you can pin the same pins to them after a while, which means more and more people seeing and repinning your posts. You can look at other bloggers’ group boards to find ones you might want to join, then follow the instructions to get invited to pin on that board. Great tip about the Alexa Toolbar. I didn’t know that and would love to raise my ranking . Thanks! Yes! All bloggers definitely want to have the Alexa toolbar. I definitely need to improve my pictures with my posts. I’ve been fiddling with Canva to edit pictures for my posts, but I am learning it is harder than it looks to make one that works well and where the background picture doesn’t overwhelm the text. I use Canva sometimes, but it drives me crazy sometimes! I prefer PicMonkey (just the free version), but it has its downside too (since it’s just an app, you can’t go back and re-edit your images, you have to start over). Great list! Your blog inspired me to start my own financial blog. I haven’t promoted it any since I wanted to wait until I had more articles available and it sounds like that was the right choice. The link for stock photos will be very useful. Terrific post! Quick question about the 14-free trial on Bigstock that you mentioned: You write that you can download several photos during this trial period – but they still have copyrights, no? I.e., can you actually use them on your own blog/site? How does this work? Any advice about getting royalty-free or copyright-free photos, etc., would be much appreciated. (Am trying to avoid posting any photos that I shouldn’t be posting!) Thanks. Hi Mary! You can use them on your blog. You can read the terms, but the gist is that you can’t resell the photo. When you “buy” stock photos (or buy credits, get free credits etc), you are paying for the license to use the stock photo (otherwise why would people pay for stock photos?). There are free stock photo sites as well, but many of them require attribution (a link to the photographer, etc) as the form of payment. It is my understanding that the photos from Bigstock require no attribution (one of the reasons I really like them). First of all, thank you for the great site! I just found it and I like your story a lot. I’m busy with improving on both points. The interesting content is the hardest. My site is about dividend growth investing and I’m still in the learning phase. Therefore I don’t have the extended knowledge to post informative articles. How would you cope with this? Further I tried the “send email on reply” addon. Nice tip! But when I install it I don’t get the extra possibility yet when posting a comment. Does this only work for new posts? If it should work for old posts to, what am I doing wrong then? Have you identified who you avatar is? Who is your ideal reader? Who are you trying to serve, help, inspire, entertain, etc. Once you know that (even put a name to your Avatar if it helps you to personalize things), you will have a much easier time writing great content. Don’t fall into the trap of trying to please everyone or attract everyone as your reader. When you do that, you end up appealing to no one. Like you said, you are new to the topic you’re writing about, so don’t try to write complex articles on investing. Newbies don’t want that, but they would probably enjoy reading about someone “in their shoes” who is just learning. Don’t be afraid to share your mistakes too. People relate better with people who are people (not perfect) than a know-it-all. Just my two cents. Hope that helps! The comment plugin should work for all posts, not just new ones. I’m not a technical guru, so if you have questions on installing the plugin itself, I would have you contact the support folks for that plugin. Thank you so much for this article. I came across your site while researching selling on etsy. I am looking to earn income from home while homeschooling my children. I would love to start a blog and I have had a few ideas about it, but with so many wonderful blogs already in existence, is it too late to be able to actually make good money blogging? Is the market too saturated? I have wondered the same thing about etsy (unless you have something really unique). Thank your for your openness in sharing so much about your journey. Great post, Stephanie! Tailwind Tribes + BoardBooster + Group boards on Pinterest have been GAME CHANGERS for me! Thank you for sharing with #HomeMattersParty!